The types of trees featuring thorns grow in different U.S. Department of Agriculture plant hardiness zones throughout North America. Some are landscaping trees, often used to create hedgerows and barriers. Factor in the amount of traffic in an area before planting one of these thorny trees where people may tangle with them frequently. 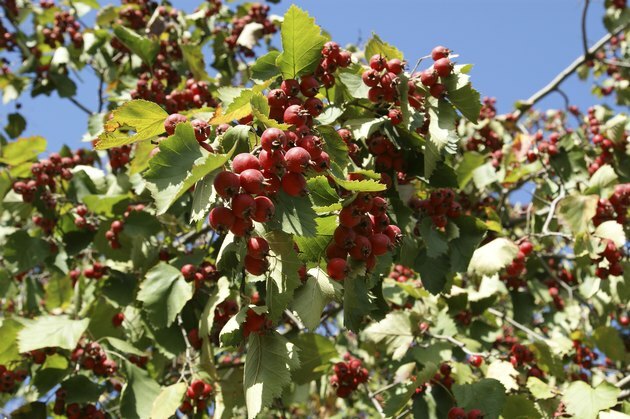 Washington hawthorn's red berries give the tree visual interest. The cockspur hawthorn (Crataegus crus-galis) a native tree from Quebec southward to North Carolina, so it tolerates the cold associated with zone 3. This is a flowering tree growing to between 25 and 35 feet high, generating clusters of white flowers during May. Its thorns reach lengths as long as inches. Washington hawthorn Crataegus phaenopyrum) is another zone 3 species of hawthorn with thorns and spring flowers. The toothache tree, often the size of a large shrub, generates flowers before its leaves fill in. The prickles it possesses are on its leaves and stems; the fruit is red-brown and gives the tree ornamental value. English hawthorn (Crataegus laevigata) and green hawthorn (Crataegus viridis) are not quite as amenable to the cold as the thorny cockspur variety (Crataegus crus-galli inermis), but zone 5 winters are suitable for their survival. Green hawthorn comes in a cultivar known as Winter King (Crataegus viridis "Winter King"), with fewer thorns than the parent species. It produces white flowers, fruit similar to crab apples and red-purple fall foliage. As time passes, the spines on the trunk and older stems of the harigiri tree (Kalopanax septemlobus) wane away, but the new growth has no shortage of thorns. This Asian tree for zone 5 flowers profusely in July, growing to 60 feet in cultivation. The thorns on the American plum (Prunus americana), a tree appropriate for zone 7, grow to between 2 and 3 inches. The flowers emerge before the leaves do on a plum, giving the landscape some white color in March and early April. 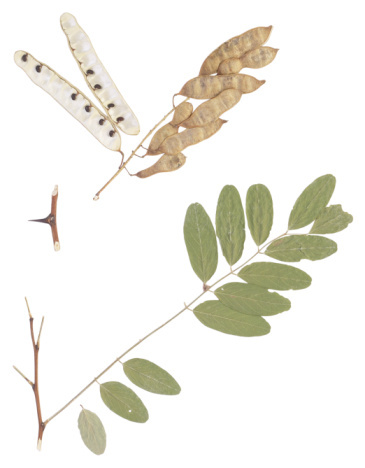 Other trees owning thorns in zone 7 include the Washington hawthorn; black locust (Robinia pseudoacacia); honey locust (Gleditsia triacanthos); and black locust cultivars such as Twisty Baby (Robinia pseudoacaciaare "Twisty Baby"), small trees with tiny spines. The honey locust has an assortment of features landscapers find appealing. The tree has compound leaves, flowers and long seedpods. The thorns are all over the trunk and branches. The jujube tree (Ziziphus jujuba) grows into zone 9, a native of China that produces edible fruits with a taste similar to dates. The leaves of this tree are shiny green, armed with a pair of spines. Sharp thorns guard the branches of the chittamwood (Bumelia lanuginosa), a tree native to the Southeast and suitable to line property borders. This tree has long-lasting foliage, with the leaves not dropping until late in autumn. An Osage orange tree (Maclura pomifera) is not actually a citrus tree, but rather a tree with so many spines; it served effectively as a fence before barbed wire came along to replace it. Farmers and ranchers planted it in rows, knowing its long spines would discourage animals and people from trying to get by it. It has ornamental value because of its fissured trunk and bright green foliage.